When I stroll Dubrovnik during the tourist season I overhear the guides and know some of what they say is just not accurate. The tourists listen and then repeat it on internet forums and so, misinformation is spread and we get further and further from the truth. Today, it is time to get the true facts about the cross atop Mt.Srd. After much research including extensive discussion with my friend Father Mirko from the Dominican Monastery, I must share with you the accurate details. 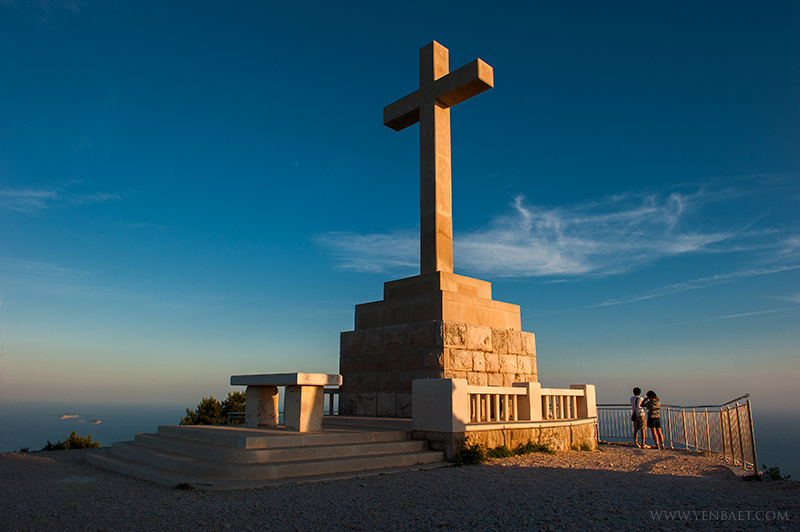 The cross, a gift from the Archdiocese of Brac, was constructed with the luminous white stone quarried there. The island of Brac is located about 100 kilometers north of Dubrovnik, near the town of Split. The cross was erected in 1935 as a celebration of 2,000 years since the birth of Jesus. It was destroyed by mortars and shelling during the war in 1991, as was the cable car used to reach the top of Mt Srd. After the war ended, reconstruction of the cross was done and again is positioned atop the mountain overlooking the town. The fastest and easiest method of transportation to the mountain top is via the cable car which reopened in 2011. For travelers who are more adventurous and in shape, there is the serpentine path which can be walked; this option is not for the faint hearted. Along the path there are thirteen markers which are the Stations of the Cross; many pray at each station. Stations of the Cross are a series of artistic representations which are typically placed at intervals along the side walls of Roman Catholic churches and often depict Christ carrying the cross to his crucifixion. On certain religious holidays there are residents who make their way up the serpentine path. They are always accompanied by the Dubrovnik Trubonari (guards of honor) carrying their old musket rifles which are shot off once they reach the mountaintop reminding the locals an important event is happening in town. It is important that travelers learn the accurate history of the town and have a rewarding experience of our culture. Take the time and find the services of a private guide to have a quality tour. It is a reality that you get what you pay for and more often than not a large group is not the best choices for guests. Because an opportunity is presented to you and inexpensive does not mean it is a good value. As with most professions, there are outstanding workers and those who choose only to show up. Dubrovnik has a vast number of tour guides with an in depth knowledge of the cultural and historical aspects of the town. We do indeed also have those few who are not locally born and bred and are here only for the season with limited knowledge. It is important to pick a guide with good references to enhance your visit to Dubrovnik. This entry was posted in Cultural and Historical Sites, Pearl of the Adriatic, Recommendations and tagged Cable Car, Croatia, Destination Specialist, Dubrovnik, Dubrovnik views, Dubrovniklady, European travel, Stradun by Cavtatlady. Bookmark the permalink. Thank you. I do have a problem with guides who do not have knowledge of the history of our sites. Well said! So often the case at many destinations visited around the world! Thanks for your information about the cross on Mount Srd. I paid a visit to Dubrovnik last May and got to the top of Mount Srd by the cable car. As I had no idea about Croatian, I did not know how to pronounce the Croatian word “Srd”, and the meaning of “Srd”. Why was the mount named “Srd”? On my return, I checked up the word “Srd” via Google, and found that it perhaps meant “Wrath”. But I am still wondering Why the mount was named “Srd”. Could it be relevant to the homeland war in 1991? I would much appreciate it if you could give me some information concerned. Mt Srd was named many hundreds of years prior to the homeland war. I have no idea of the origin of the name, but you can try to do more research. Do keep in mind that our local history dates back to 600 BC, good luck.